Any work of history that attributes the start of the Cold War to a single factor will surely invite criticism, but Campbell Craig and Sergey Radchenko’s The Atomic Bomb and the Origins of the Cold War makes a compelling case for running that risk. Craig and Radchenko arguethat the specter of the atomic bomb shaped the ways in which the U.S. and U.S.S.R. designed their own and reacted to each other’s foreign policy agendas during the early years of the Cold War. 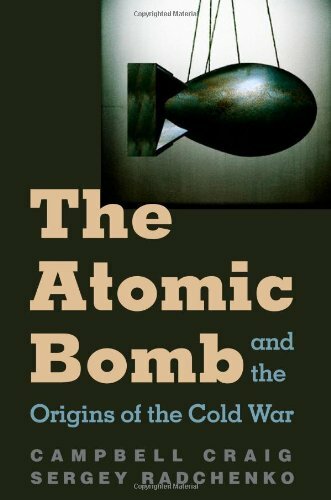 The authors trace the first signs of an impending Anglo-American split with the Soviet Union to August 1943, when FDR and Winston Churchill decided to keep information about the building of an atomic bomb in Los Alamos a secret from the world, or from the Soviet Union in particular. Failure to establish a system of international control over atomic weaponry before FDR’s death further polarized American and Soviet relations during the Truman presidency, a period of haphazard atomic policy that coincided with the bombings of Hiroshima and Nagasaki. Secrecy and mistrust plagued Soviet-American relations from then on, sentiments that grew manifest in clandestine Soviet bomb construction projects and atomic espionage. News of Soviet espionage made cooperation with Stalin a matter of political suicide for Truman and left dismal chances for creating an international body to neutralize the threat of nuclear war. Craig and Radchenko offer valuable insight into the practical concerns that plagued American and Soviet deliberations over atomic weapon development, use, and policy. Indeed, at certain points the book more closely resembles a work of diplomatic policy than diplomatic history. For instance, they outline in great detail precisely why the advent of atomic technology prevented Soviet-American cooperation from fomenting during the immediate postwar years. For cooperation to occur, both countries would have had to submit to a larger international body that would seize their atomic bombs, monitor their operations, and have the power to intervene in their internal affairs when necessary. Essentially, the U.S. and U.S.S.R. would have had to relinquish claims to their own national sovereignty and positions of power and answer to an international body in semblance of an all-powerful state. The likelihood of this happening, as Craig and Radchenko state with hints of humor, was slim to none. 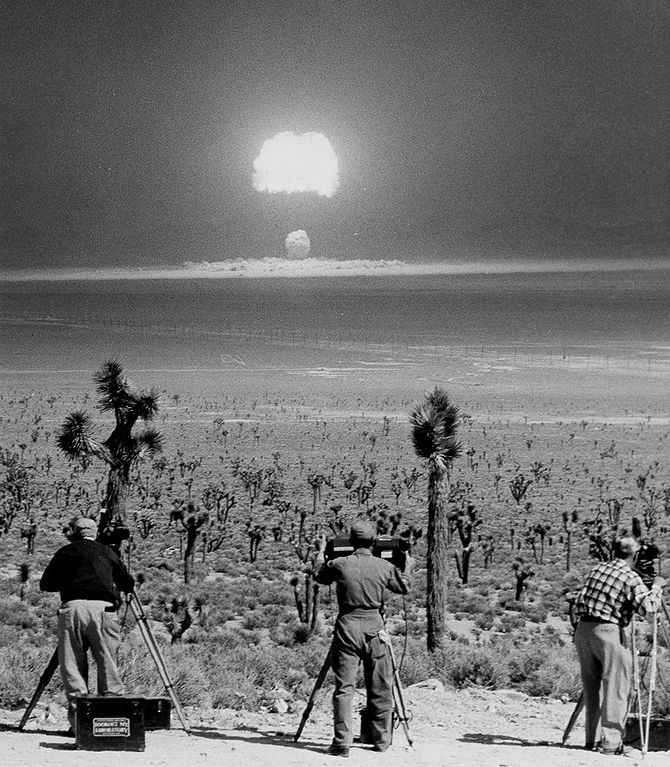 A nuclear test carried out at the Nevada Test Site on March 29, 1955 as part of Operation Teapot. Image via Wikimedia Commons. One point where Craig and Radchenko’s analysis runs astray from the historical record is during their discussion of American scientists and their impact on early atomic diplomacy. The authors boldly assert that “when one is interested in assessing American policy about the bomb after 1944…one must recognize that the scientists’ actual effect on it had become inconsequential.” Surely this is a contentious point. As the historian Matthew Evangelista notes in his survey on the role of scientists in affecting Cold War nuclear policy, U.S. and Soviet scientists met at the Conference on the Peaceful Uses of Atomic Energy in Geneva in as early as 1955. Craig’s claim, however, is made less egregious by his astute discussion of Igor Kurchatov and other Soviet scientists lobbying the Politburo for the resources to build a Soviet atomic bomb before the Americans built their own. The battle between the U.S. and U.S.S.R. for scientific prestige and innovation in the modern age resonates throughout this book, and infuses the authors’ historical intervention with a contemporary flavor that speaks to the present-day relevance of the subject.